“What details should we use for the final closing documents” is something that every entrepreneur wants to hear. I’d been working on a new idea for over 6 months, had a great team lined up and was on the eve of closing a $1.5M seed round with some of the best investors in the world including Brad Feld (Foundry Group) and a small collection of amazing angels. And then I killed the idea. Below is the note I sent to my would-be investors. I take my responsibility as a CEO very seriously and would only accept your capital when I had a damn good, defensible plan on the best ways to spend it to achieve success and at this point, I do not. After careful consideration, the original idea of our “personal health record (PHR)” has too many issues/risks for me to proceed with the adequate levels of confidence. Therefore, I am postponing fundraising until I have more clarity and conviction around an idea worth funding. I spoke with Brad Feld yesterday and he was predictably thoughtful and supportive, which is how I have come to know him and the main reason why I want to work with him (and Foundry) in the future. I’m happy to connect with anyone who wants to discuss in more detail, but the combination of incentives (most providers don’t want you/us to have the data and will therefore actively make it hard to get), patient apathy (most people aren’t proactive and data-driven about their health), potential costs imposed by the provider during records collection (for example, in WA state a provider could charge a $22 clerical fee, $.96/page for the first 30 pages and $.73/page for all remaining pages (deal killer/frustrating/stupid) and this is implemented differently in every state and varies a ton), lack of a “I need that” feature, the significant amount of coding needed to do to get a viable solution and the fact that several competitors (Gliimpse, Prime, Picnic) have a significant lead on us, all total out to the wrong foundation to build around. Startups are hard enough without all of these factors stacked against you. I hope you can appreciate the level of frustration and disappointment I feel right now. I am an optimist, pragmatist, and enthusiastic competitor and I fully expect to do a new company, hopefully in the healthcare space, and I hope you will consider investing in me (and my team) in the future. Thanks again for your belief in me, the idea and the future of health. Obviously, this decision and email are pretty hard to write. But, it was the right thing to do and the right time to do it. But, how did I get there, what could I have done to prevent this outcome and what do I plan to do differently as I look for an idea worth funding? As a collegiate athlete (I went to Purdue on a swimming scholarship) and then a professional sailor doing long, offshore events, I’ve always dreamed about systems that could collect data about me, learn and suggest ways to optimize my performance. Then my mother was diagnosed with colon cancer, my father had a stroke and my brother and I struggled to help them understand their conditions, coordinate their care and look for the best solutions (specialists, clinical trials…). This was frustrating, time-consuming and not very “smart” and it seemed like a software solution could really help in both cases, a “platform for personalized health”. 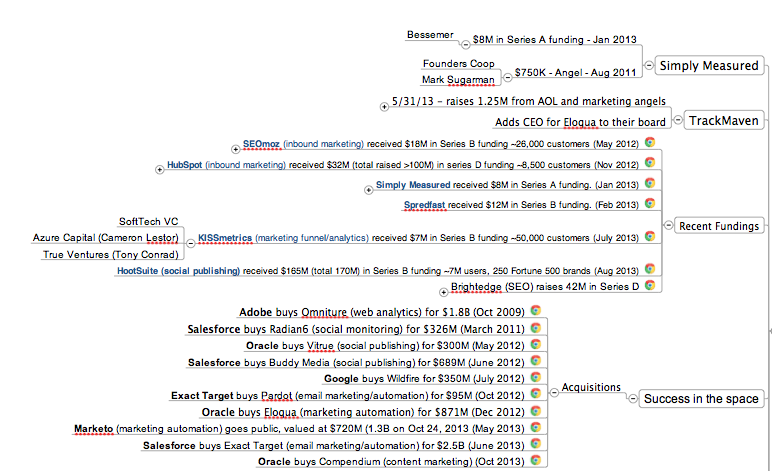 Ideas percolated for several years, while I built and sold Gist (where Brad was an investor) and started Rival IQ. At some point along the way, Brad asked me, “what’s standing in the way of you building the health platform and doing it with us as investors?” I didn’t have a good answer, so I got to work. My first steps were a blend of customer development and MVP creation. I set up this survey to learn about potential customers (would be great to have your input too) and started having conversations with users in my target personas (“self-advocates” — people with critical or chronic health conditions looking to take control of their own health and “optimizers” – people who wanted to use data and experimentation to get more from their bodies and minds). I was lucky as I have experienced both of these states so I was scratching my own itch, which is a good thing to do as an entrepreneur. Then, as I’ve done in the past, I got together a team of “night-time hackers” to build a rough MVP of our core idea. This team met on Wednesday nights and included 3 developers, 1 designer and me. All of us were interested in the problem space, working with each other and brought complimentary skills. We grabbed hours when we could on evenings, nights and weekends and focused our sessions on learning, data sharing and trying to get something working. The goal was to make a mobile app that worked something like; install, find your doctor, take a photo of your drivers license, “sign” on the phone (to validate identity) and then magically (after a few days time) you have copies of all your past health records, accessible on your phone. Obviously, we had many ideas of what you could do next (visualize your health history, find correlations and causation, compare with norms, share with others, enhance with other data…) but we wanted to make it fast, easy and free to get your records. After a few months, we had this working (with lots of issues) and it was really cool! Starting a company requires some blend of imperfect data, reasonable assumptions and a collection of smart people who think the problem can be solved, but is ultimately some leap of faith. With a bunch of customer input, tons of research and an MVP, I decided to quit my day job and go for it. I went back to Brad, further articulated my plans, solutions to some of the issues we found, built a rough model with users, growth, team, revenue…and decided I needed 1.5M to get going at the pace I think the idea deserved. Brad was thoughtful in his questions and we agreed to fund the new company. I was on cloud nine and it was hard to contain my excitement! For each category, I made a list of my top prospects. With Brad’s support as a foundation, I leveraged my network, found connections and followed much of the advice I’ve given before in these posts. For each investor, I articulated the vision, our progress and why I wanted them specifically to be part of the company. Within 30 days, I had an awesome group lined up with several people I only dreamed of getting when I started the process. Time marched forward, we hired an awesome legal team with great experience in the space, drafted documents to form the company, raise the round and get started. I made my first offer to a full-time employee, who could add necessary medical expertise to the team. She chose us over an existing offer and gave notice to her current employer. I started talking about the idea more broadly and made plans for an impending public disclosure around the financing. All systems go with a plan to close in mid-October! While I was raising the money, we were also working on enhancing the prototype, diving deep into policies and regulations, talking to medical providers and continuing our customer research. As my enthusiasm for working with the team and the investors was increasing, we starting finding serious structural issues in the overall business, mostly outlined in my note to investors. We looked hard at incentives (who wanted us to succeed and who might want us to fail) and I will do this much more deeply in the future. We considered many, many options on ways to incentivize the consumer more and solve the structural issues that seemed entrenched on the provider side (very hard to do). I was optimistic that we could find good solutions but as the days marched forward toward the financing timeline I had communicated, the negatives mounted and my confidence decreased. During every startup, you reach points of critical inflection; when to narrow to a specific focus (vs. idle chit-chat about ideas), when to start coding an MVP, when to commit full-time and quit your day job, when to raise money, hire your first employees… Obviously, there are many more points in the future, but these early points are some of the most critical. As an entrepreneur, each of these points presents an opportunity to take stock, weigh the risks/rewards, make a plan and then re-commit to the next major milestone/inflection point. Knowing Foundry and the investors I’d lined up and the team I’d recruited, I knew that we were all committing to at least 3-10 years of our lives to work on this idea. I wrestled with the idea, brainstormed with the team, talked with other CEO’s I respected and discussed with my wife who has seen me succeed and fail in the past. The process of discussion and communicating my decision-making criteria helped it crystallize my opinions and in the end, the calculus was not right. I was in Boulder for a Full Contact board meeting and I’d aligned our schedule around this date. It was planned to be a celebration of the financing, a new company, and a new adventure. Brad and I first met during a run along the river in Denver way back in 2008. While building Gist, we talked about many challenging issues while running or walking. On this day, we walked to Boulder creek trail and I explained my logic and decision. He seemed to know this was coming, which is likely just good investor intuition. I was sad, frustrated and even a little embarrassed. He was conciliatory, thoughtful and supportive. The next day, I sent my note to the other investors and the other partners at Foundry. Some were surprised, many appreciative and this made me feel even better about my decision. I remain sad, frustrated by the systems and incentives at play in healthcare. As for healthcare innovation, I do plan to keep working toward an idea worth funding. I hope the other players in the space succeed and I am inspired by people like Eric Topol, Jonathan Bush, Peter Diamandis, and Atul Gawande to find solutions that deliver better results and a life of “optimal health and peak performance”.